Traveling Bistro is a winner! Traveling Bistro has won the Austin Chronicle Best of Award 2009 for Best Catered Sunday Brunch at a Bar!!!! Beau Been left his full time job to live his dream and I am so proud of him! The Daily Texan agrees! Thanks to every single one of you who has come to brunch or a Traveling Bistro event. Sure they give me credit in the article because I serve the waffles, but it is my fantastic husband, Beau, who makes all the Like Water For Chocolate magic happen! He’s only just begun! YIPPPEEEEE! Congratulation Traveling Bistro! You make my tummy happy!!! Join us each week at the Traveling Bistro Sunday Brunch at NOMAR BAR! So sorry we will not be having brunch Sept 13. I would also like to point out my company Groovee Fortune won Best Local Web Designer in 2005 and they haven’t ever had the category again so I consider myself the reigning Web Design winner each year. I’m just saying! ha! Many thanks to Miguel who always includes Beau and I in the fun!!! Congratulation to all the winners!!!! Cheers! Till we vote again!!! This might be able to compete with Pistachio Gelato! Come to the Cupcake Smackdowm, Saturday, August 1st! Traveling Bistro will be providing the only non-cupcake food items, Jerk Chicken on a Stick and Bourbon and Coke Pork Chop on a Stick! Beau Been is in this Fox 7 clip! The event is dog and people friendly!!!! WATCH FOX 7 highlight. Join us for some food, libations and fun! As owner of Groovee Fortune, I need to know about all the latest fads on the internet. Currently, I spend too much time taking quizzes and catching up with old friends on Facebook, playing Mobsters on MySpace and playing Word Womp on Pogo. At least it’s fun and I’ve learned a few things I can pass on to you. Take these seemingly time wasting applications and make them useful marketing tools. Facebook – What is Facebook? How can you use Facebook? My husband owns Traveling Bistro and we serve Sunday Brunch at Nomad. Each week I taunt my friends with the Waffle of the Week by posting it in my STATUS including a link to the page with the menu for the whole month. I have been put on Waffle Probation by some who want to come to brunch and don’t live in Austin, but they know about brunch if they make it here. Periodically, I post links about Groovee Fortune Specials and News. You can use FB to promote your band’s upcoming show, your business’s sale at your shop or online, an exciting event in your life by updating your status where it says “WHAT’S ON YOUR MIND?” You can post longer items with who, what, when, where in NOTES or you can set up an EVENT, but you will have to add each person individually. NOTES are posted to everyone on your friend list and EVENTS allow you to be selective. If you have a web page with all the info already laid out and you want everyone to know about it you can post a LINK to the web page. You can’t customize the look of your FB page at this point. There are all kinds of quizzes and things to send your friends to let them know you care. Just last week I played trivia with someone from high school, a fellow Hell Mary, a friend from elementary school and a guy from college all at the same time! Yahoo Groups – What are Yahoo Groups? How can you use Yahoo Groups? Groovee Fortune has set up Yahoo Groups for it’s Groovee Clients, the Texas Rollergirls, Rank and Revue Magazine, Alejandro Escovedo…. to name a few. If you have a group or organization that needs to share files, links and information this is a great tool. It is not so much a socializing tool as an administrative one. The Texas Rollergirls still use these Groups to share suggestions, events, opportunities, etc. Before the existence of MySpace and Facebook, this was one of the only tools to network music fans together. There is a calendar where they can set reminders for shows, send out press releases, announce upcoming albums to a group who specifically wanted to receive this information. The difference between this and a newsletter or mailing list is all participants can contribute to the conversation if you set it up in that manner. You can also use it like a mailing list or newsletter by changing the settings but it’s really all text based. Rank and Revue Magazine used their Yahoo Group to let writers and photographers know about deadlines and opportunities. It has a spot to organize TASKS for a group. Groovee Fortune has a Yahoo Group for it’s clients, but since the clients don’t all work for GF it’s kind of a one sided conversation, but I do post events, holiday greetings, specials, etc. MySpace – What is MySpace? How can you use MySpace? MySpace is a lot like Facebook, but I feel it is really well suited for bands and the entertainment industry. You can customize the heck out of MySpace with graphics and backgrounds and your own jukebox. Bands can post songs for listening and this is much better than having the music files on your own web server. You can post BULLETINS that go out to all your friends, set up EVENTS where you select who will see the post. You can change your STATUS in the same manner as discussed with FB to promote a small snippet of what’s happening. These last three tools allow you to send private messages to individuals. I am addicted to Mobsters and finally starting to know what in the heck to do to win! You can add images and links to Myspace, especially if you know a little HTML. Matthew Ballard uses it to promote his latest album, host music clips and promote shows, the Texas Rollergirls post their bouts and the Jackalope uses it to promote current specials and directions. Twitter – What is Twitter? How can you use Twitter? I will be honest and say I am new to Twitter but it seems to just be the STATUS tool on MySpace and Facebook. You can only post a few lines (140 characters including spaces). I feel compelled to tell you about this tool because Austin was all a Tweet during SXSW and I’ve seen a lot of news anchors speaking of Twittering. I also love the lingo that is developing around it with words like “Twitterific.” Please feel free to post any comments about it’s strongest usages. It is a big hit and I expect it will develop more marketing applications for me in the future. I need to add more friends so I am not tormenting 5 friends about waffles. Wordpress – What is WordPress? How can you use WordPress? I got a blog on WordPress because so many clients were asking if they needed a blog. 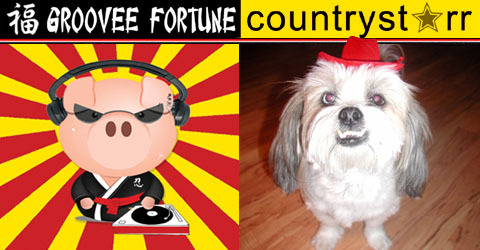 I wasn’t too thrilled with the idea but now I LOVE my Groovee Fortune Countrystarr Blog. I spend a lot of time posting YouTube videos and dumb pictures of me from the past, but I do use it to promote events like Plutopia, Traveling Bistro Sunday Brunch, Groovee Fortune Specials and News, information about clients, friends and points of interest, etc. There are many templates to choose from for your blog and you can customize what information shows up – other blogs, categories, a calendar of your posts, etc. I will note that you need to know CSS to really customize the look of your blog. Blogs get amazing results on search engines and you don’t have to know HTML to add images and links. Artists can post new works, bands can tell about recording their latest album or link to a new video and business owners can post info about sales, events, etc. You are reading WordPress right now and I’ve already told you about Sunday Brunch and Groovee Fortune. Be sure to add tags a.k.a. keywords to your posts so the search engines will head your way and create categories so readers can break all the info down into groups of interest. The stats on WordPress are awesome and break down lot’s of info so you know what is getting read.